Even though I’m a professional writer and an avid traveler, I’ve always struggled with travel journaling. With the excitement and exhaustion travel brings, facing a blank page usually feels like too much work. While I love the idea of a beautiful, art-filled journal with sketches, memorabilia and lengthy tales of my adventures, I know that’s not going to happen, even with my best intentions. Wouldn’t the time be better spent actually experiencing the journey anyway? I have, however, experienced the benefits of journaling in my daily life. I know how powerful it can be for boosting my happiness, self-awareness and overall well-being. That’s why I’m on a mission to make keeping a travel journal fun, easy and inspiring for those who want to get more out of their trip. Hopefully, this guide will help you tap into this incredible tool for self-discovery, personal growth and archiving meaningful memories—even when there are new places to explore, things to do, and wine to drink. Travel journaling combines the external discoveries of our travels with the internal exploration of our soul. When you write, you get out thoughts you didn’t even know you had, you organize the chaos in your mind and you begin to realize what truly matters to you—your values. Of course, this is all possible without leaving your own bed. Travel accelerates the processes by putting you in situations that help you compare what you know with what you don’t know. It takes you outside of your daily life, giving you perspective. It opens your heart and mind to new ways of being. Photos make for wonderful memories too, but they can’t tell you how that cardamom coffee in Jordan smelled and tasted, or how a conversation you overheard in Paris sparked an ah-ha moment. Vivid Memories: Describing what you’re experiencing with all five senses helps store and evoke vivid memories. Simply taking the time to notice what you’re seeing, smelling, hearing, touching, and tasting also keeps you in the present moment as it’s happening. Gratitude: Want to be happy? Practice gratitude. Keeping a travel journal will help you fully appreciate your trip and your life at home. Healing: Are you embarking on your own “Eat, Pray, Love” type of trip? Both traveling and journaling foster transformation, self-love and clarity so you can move forward in life. Mindfulness: You’ll get the most out of your trip when you stop to truly live each moment instead of rushing from sight to sight. Journaling helps you slow down and notice. Self-Awareness: Feeling stuck in life or keep repeating the same patterns? Use journaling to examine your behavior, values and desires in the context of new cultures, new experiences and challenging situations. Creativity: Travel boosts creativity no doubt. Let your surroundings inspire you and use your journal to remember and develop all those creative sparks. Even though it might seem simpler to use an app or to type up your journals, putting pen to paper has proven benefits that you can’t get from a digital experience. Scientific studies show that the physical act of writing uses the analytical and logical left brain, which means your creative right brain is freer to engage in thoughts, feelings and emotions. This boosts your intuitive powers and helps you better understand your inner and outer worlds. Writing by hand also helps you retain information and memories better. Handwriting also complements a key component of happy travels—unplugging. Using your phone or a computer to write could easily slip into a landslide of digital distraction, which means not being fully present in the moment. Not a fan of long-form writing? Write lists, sketch, answer writing prompts or some other form of noting your thoughts. Keep it short and finish in five minutes. Dwell longer over a cup of coffee. There aren’t any rules. Do what works for you. Dedicate 10-20 minutes first thing the morning and again in the evening. Of course, you can journal more, but making it a part of your morning and evening routines will help you keep the habit when you’re busy exploring. This ritual also keeps you excited yet grounded while traveling. Sit by a window, go to a local coffee shop, or even better, get outside in nature or a park to help the journaling flow. Most people think of travel journaling only as something you do while you’re actually traveling. But that’s only part of it! You’ll get the most out of both the inner and outer journeys by using your travel journal before, during and after your trip. Keep a planner of your transportation and accommodation details, a budget tracker, language and currency notes, packing lists and other logistical information. Have a journaling session before you go to think about what you personally want to get out of this trip. Not just your must-sees and foods to try, though those are good too. How do you want this trip to help you grow? Where are you feeling stuck in life or just need a boost of inspiration? How can you be open to what this journey can teach you in regard to that issue? Brainstorm ways to challenge yourself in each one of the following areas. While you’re traveling, you can look at this list daily to check in with how you’re doing. Adventure: What can you do to get the adrenaline pumping? Anything from a nearby hike to skydiving! Everyone loves a good inspirational quote, right?! Add your favorites to your journal before you leave to keep the wanderlust strong. Here’s where the rubber meets the road. Keep it simple with a few questions in the morning and evening to align you with your trip intentions (from your pre-trip journaling) and get the most discovery and meaning out of your days. With a wonderful trip behind you, now you can take a big-picture view of what you learned, archive meaningful memories and think about how you can bring positive change to your life at home. You might want to give yourself a little time after the trip to let your thoughts marinate, but not too long that you start to forget how you felt on your trip. A couple days to a week—tops. What was the most challenging and how did you react? Do you wish you reacted differently? Did you get what you wanted to get out of the trip? What would you do differently next time? What activity/behavior/perspectives would you like to adopt back home? Maybe you want to go beyond the basics and turn this journal into something more. These travel journal ideas will help you stay happy, healthy and inspired during and after your travels. Favorites Lists: Your favorite foods, drinks, views, conversations, streets, museums, coffee shops, etc. 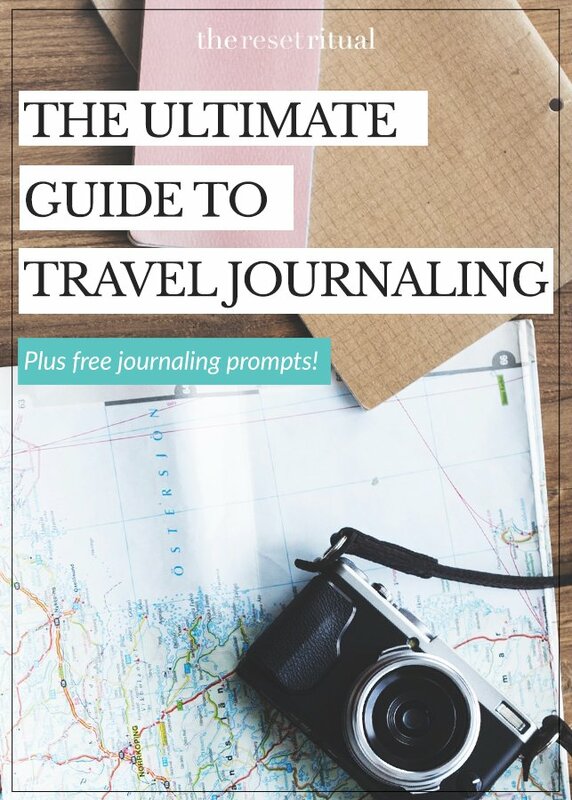 Scroll down to download your FREE travel journal prompts for self-discovery and meaningful memories now. I just want to tell you Reset Ritual is absolutely brilliant. Thank you for sharing. I so appreciate your generosity. I travel a lot. I like to travel journal but was never very good at it until I discovered the MIdori travel journal method and how perfectly your prompts, insights and beautiful ideas align with that method. It will make all the difference.